Actually, it is Jed’s adventure, but I entitled it with Duffy’s name since the reason for this marvelous expedition is because of Duffy. For those of you who know me, Duffy is my alter ego – my clown side. 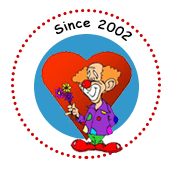 Duffy is a co-founder and helps manage our six year old, all-volunteer nonprofit, Caring Clowns International. Of the many clowning gigs we do, supporting our military personnel and families ranks high on our list. Over the past six years, we have been privileged to perform for all our military services. One, of course, has been for the men and women of our U.S. Navy and their families. We have performed for members and families of submarines, aircraft carriers and destroyers at homecomings, home portings, picnics and seasonal parties. Among them is the USS Abraham Lincoln Aircraft Carrier (CVN-72). Over the years, I have been privileged to get to know John Porter, the Director of Morale, Welfare and Recreation aboard the USS Lincoln. John is responsible to arrange all the social activities onboard the ship as well as in the ports of call the ship visits. He has been responsible for us clowning and traveling on the USS Lincoln on numerous occasions. John does fabulous work! A “Tiger” in Navy parlance is a guest of a crew member (normally a relative) who is hosted on the ship for a return-from-station cruise. Soooo, I am honored to have been included on the USS Lincoln 2008 Tiger Cruise as John’s guest. The options were to travel aboard the USS Lincoln from San Diego to Everett or from Hawaii through San Diego to Everett. And THAT is what took me to Honolulu on September 30 to join the ship at Pearl Harbor for the trans-Pacific voyage home to Everett. I proudly served as an officer in the U.S. Air Force for five years many years ago. But, my true love was the Navy. Unfortunately, I did not know that when I headed off to college (and compulsory ROTC at that time), that one had to qualify for Navy ROTC in one’s senior year in high school. So, I missed the opportunity then. I loved my brief Air Force career, and will always be proud and grateful to have served as an officer in the U.S. Air Force, but the Navy has always been very special to me, too. Being on a cross-oceanic Tiger Cruise now, and on one of the most amazing floating cities of our U.S. Navy, is full circle for me. It is a dream come true. I have tried to capture my feelings and observations here, for posterity and for those who might enjoy seeing this journey through my eyes. Enjoy! I apologize up front to those of you who really know what you are talking about when it comes to the U.S. Navy and especially aircraft carrier lingo and activities. Please allow me some editorial license. Some of the terms, et al here may not be totally accurate. Just have a good laugh and know that I am the clown who tried.